First of all, I'd like to apologize to any and all non-Israelis who may not understand the pun above, even after reading this post. I'd also like to apologize to any and all Israelis for the pun. I'm sorry, I just couldn't help myself. Let's talk about pie. Let's talk about the pie of pies, David Lebovitz's Pecan Pie with Bourbon and Ginger. Actually, no. Let's not talk about it. Let's just stop and think about it for a second. Just imagine it. Bourbon. Ginger. Pecan. Pie. I haven't even gotten to the maple syrup, or the three types of ginger and I bet you're already salivating. I know I was when Lebovitz's recipe showed up on my Twitter feed just before Thanksgiving. I had my hands full what with the turkey, cranberry sauce, sweet potato rolls and chestnut soup to make, so I thought, I'm just going to file this one away for next year and delegate the pecan pie to someone else. Fortunately, that someone else ended up being my roommate. Fortunately, I not so surreptitiously emailed her this recipe. Wink. Wink. Nudge. Nudge. Let me just say that it is a miracle that that pie made it to Thanksgiving dinner. About 20 minutes after she put in the oven, the house filled with the most amazing smell imaginable. There are no words to describe it. If happiness had a smell it would be the smell of this pecan pie. It took everything we had not to just dig into that pie right as it came out of the oven. As it was, we spent most of the evening hovering over the cooling pie, just so we could catch a whiff. The Thanksgiving pie was so good, that a month later as my birthday rolled around, I thought, I don't want birthday cake, I want Bourbon Ginger Pecan Birthday Pie. (And somewhere in a fictional universe, Dean Winchester was suddenly happy and didn't know why). So once again, my lovely roommate buckled down to make pie. I had a very happy birthday indeed. Let this be a lesson, friends. If a David Lebovitz recipe catches your eye, do not hesitate. Do not save it for a rainy day. Make it. It may just forever change your birthdays or Thanksgivings or life. Normally, I would say that one should never, ever change a David Lebovitz recipe, because if there is one food writer in the world who knows exactly what he is doing and whose recipes are meticulously tested down to the last detail, it is David Lebovitz. However, for both the occasions where the pie was served we needed it to be both gluten and dairy free, so we made some changes. If you do not need the pie to be gluten and/or dairy free, please check out the original recipe. Make pie crust! Use butter! (Always use butter). 1. Preheat the oven to 350 F. In a bowl, combine the cookie crumbs and salt. Pour in the melted coconut oil . The crumbs should just hold together when squeezed. Pat the crumb mixture into a 9 inch pie pan and set aside. 2. In a large bowl, mix together the brown sugar, maple syrup, eggs, coconut oil, bourbon, fresh ginger, ground ginger, vanilla and salt. Stir in the pecans and candied ginger. 3. Pour the filling into the prepared pie crust and bake for about 40 minutes, until it is just set. (As Lebovitz says, the middle of the pie should still jiggle a little. This may take a bit more than 40 minutes). Cool to room temperature and serve. Expect exactly zero leftovers. There are some holidays where I feel free to improvise- I view them as an opportunity to try out new recipes and techniques. Thanksgiving is not one of those holidays. Thanksgiving is tradition. When I was growing up, my parents had, (and still have), a group of friends who got together three times a year-Thanksgiving at the Sterns, Hanukkah at the Saphs and Purim at my parent's place. Every year it was the same people and the same food. So what could be Purim without my mother's stuffed cabbage, and a gathering of kids watching Rocky and Bullwinkle in the basement; and what could be Hanukkah without Leonard's latkes and boxes of Dunkin' Donuts, and the kids running from adult to adult to ask them increasingly bizarre survey question; and finally, what could be Thanksgiving without Cheryl's sweet potato rolls and that long winter drive down to Hyde Park in the dying light? I grew up. I moved away. Things changed. I made my own traditions. Latkes at the Saph's became homemade donuts at Deb's. Purim, also at Deb's. Thanksgiving is mine. The guest list is not precisely the same from year to year, but it's close enough. The menu varies in its small details, but always there is turkey and cranberry sauce, and pumpkin pie and green beans and mashed potatoes. Most importantly, always, there are friends and there is community. Thanksgiving is so important to me. It has become a way to hold on to my American identity, a way of expressing my belief in the power of ritual and the importance of gratitude. It is a wonderful thing to be able to celebrate it at home with friends. 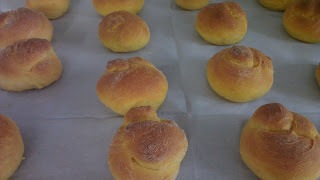 This year, I'm adding an old/new tradition- sweet potato rolls. Cheryl's sweet potato rolls are one of my most vivid memories from those Thanksgivings. I loved that they were sweet, and adorably orange. It's been years and years since I've had them, and I think I sort of missed them, so this year I decided to revive the tradition and see if they live up to my memory of them. Spoiler alert- they do. They are both less orange and less sweet than I remember them being, but they are still delightful little things, soft and fluffy and tinged with sweet potatoes. Make them, and they'll very likely end up in your yearly rotation. Sure, it's a bit of a fuss to make your own bread, but if you don't fuss on Thanksgiving, when else are you going to fuss? It's worth it, I promise. Happy Thanksgiving. May we all have many things to be thankful for this year. 2. Cover and set aside in warm spot. Let rise until doubled, about an hour. Punch down the dough and let it rest for about 5 minutes. Divide into 4 parts. Cut each part into 16 pieces. Roll the pieces into strands-about say, an inch and a half to two inches long. Knot the strands to form cute, little rolls. Cover and the rolls and place them in a warm spot. Let rise for a half an hour. 3. While the rolls are rising, preheat your oven to 400 f. When the rolls have doubled in size, slide them into the oven and bake for 15-20 min. They are done when the tops are lightly browned and a tap to the underside of the roll produce a nice, hollow sound. It started with Toffee Bars, or at least that is how I remember it. I found Jess's blog, Sweet Amandine, by accident, following a link that led me to a link that led me to a link, etc. I liked it immediately. I liked the clean, welcoming design, and Jess's warm voice. I liked how she seemed to understand that food is not only meant to nourish but also meant to evoke memories and feelings and stories. I liked the food. (How could I not? Pluot Cake, Olive Oil Citrus Cake, Lemon Curd Squares with Rosemary- and those are just (some of) the desserts). So, in a move quite unlike myself, I screwed my courage to the sticking place- because I am introverted and socially anxious even in the virtual world- and I commented on one of her blog posts. Jess was warm and welcoming, as she is, but it was the Toffee Bars (or Toffee Squares, as Jess has it) that really did it. It's hard to describe what Toffee Bars mean to me. I have no memory of the first time I ate them, because always, as long as I can remember,it has been, Mrs. Anis has Toffee Bars. Mrs. Anis is my surrogate grandmother. She has fed me and loved me since I was born and she always- may she live and be well- always has Toffee Bars. Toffee Bars is also one of the first things I learned to bake by myself as a child because they are easy and require not so very many ingredients. To me, they are a part of myself-my child self and adult self and the self that is loved and cared for- all of that is in a Toffee Bar. So, imagine my surprise when they showed up on Jess's blog- the very exact recipe- the one I have, the one scrawled on a browning notecard in my mother's hand. Imagine my surprise to find that to her they were also love and care and chosen family. Something slotted into place. Jess and I communicated on her blog and via email for a couple of years. We found other things in common- academics, that one street in Jerusalem we both lived off of, though not at the same time. She became someone I could talk to about food, obviously, but also life, academics, words, things that mattered. She became a friend. Eventually though, we fell out of touch, because, life; and I have fallen out of touch with more friends than I care to admit. It's a little bit weird to read a book by a friend whom you've never met; to come to know her again by her own words, and Jess is, by far, one of the best wielders of words I know. Her words choice is so accurate, so onpoint, it is a wonder to read. Like Jess, Stir is warm, personable, and honest. It is in turns both joyful and heartbreaking. It is a book about how to keep on when everything changes and how food can get us there. It is about Jess, and her family and her friends, and her kitchen. It's a wonderful book and I'm very, very glad Jess wrote it. I hope you will read it. Much as I loved all the food in Stir, and despite the fact that it will probably change the way I make pastry and the way I make challah, the recipe I have to share with you is not from Stir but from Jess's blog, Sweet Amandine. I make a lot of recipes from Sweet Amandine, but this is the one I make the most. It is THE soup. It is the soup that has turned many a fennel hater into a fennel lover. It is the soup that my family now makes every Passover when we've gotten sick of eating and all we want is soup and salad and maybe some matzoh and butter. It is the soup I make when summer slips into fall. It is carrots and fennel, roasted until they go brown and lovely and sweet. It is the genius of a spoon of tomato paste turning dark around a layer of oil-slicked onions and all the depth and complexity it lends. I love this soup. 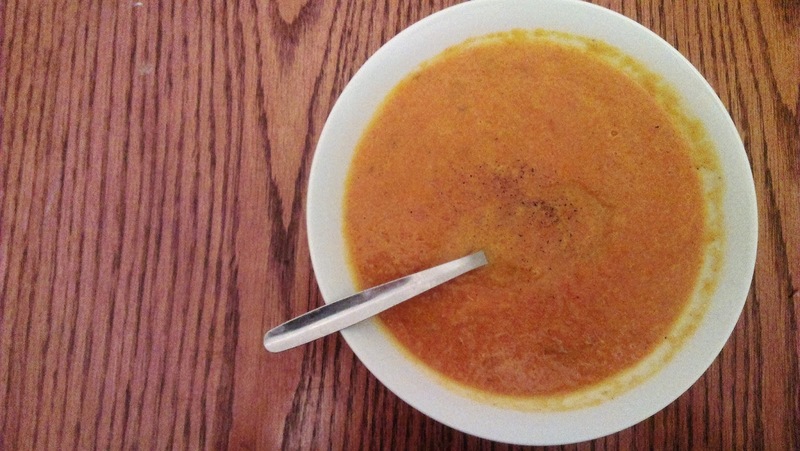 Make this soup and think of it as a teaser. Then go out and buy Stir (or take it out of your local library if you have one). Treasures await. 1. Preheat your oven to 450 F. Peel and chop the carrots into 1/4 inch rounds. Trim the fennel and then cut into 1/2 inch wedges. Toss the carrots and fennel with 1 tablespoon of olive oil and some salt and pepper. Spread on a baking tray and roast for about a half an hour until the vegetables are tender and golden at the edges and smell delicious. 2. Meanwhile, heat the rest of the oil oven medium heat in a large, heavy-bottomed pot. Add the onions and the fennel and saute until the onion is translucent. Add the tomato paste and stir. 3. By now, the carrot and fennel should be ready. Add them to the pot with the onion. Stir and then pour in 4 cups of water or broth. Bring to a simmer. Remove from heat and carefully! blend using an immersion blender,adding more water or broth to thin it a bit if the soup seems to thick. Reheat, and serve. Every night I come home from work, or if I am working from home, I close the work documents on my computer and I say to myself, "Tonight, tonight I will sit down and write." Then I go to make dinner. Two hours and a meal later, I somehow find myself on YouTube watching another episode of The Great British Bakeoff, having not written a word. I promised you ice cream. I promised you rice. I promised you onion tart. I am delivering on exactly none of those promises. I'm going to make it up to you with soup, glorious soup. 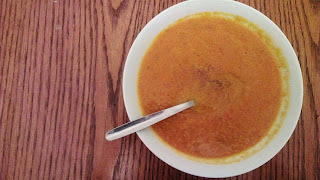 Louisa Shafia's Saffron Corn Soup is one of the best soups I have ever made. Certainly it is the best corn soup I have ever made. It was amazingly delicious served hot and equally as delicious eaten cold. Judging from the title alone, I first thought that this soup would be a delicate thing, but then I looked at the ingredients list and I saw turmeric and dried limes and lemon. I thought they were bold flavors to go with saffron and yet somehow it worked. The turmeric lends warmth, the corn a rich creaminess and sweetness and the lime gives the soup a kick of brightness. Then comes the saffron, weaving it's way through the soup in a floral undertone. If you're in America and you can get late summer corn, now's the time to make this soup. If you're in Israel, well, you'll just have to make due with the starchy, sort of bland vegetable that passes for late summer corn around here. Sorry. The soup will still be good though, I promise. A note on ingredients: In Jerusalem, dried limes can be found in most of the spice stores that line the alleyways of the Machneh Yehuda Market. I imagine that they can be found in any good spice store throughout Israel. I know less about finding dried limes in America. If anyone has good leads, please mention them in the comments. 1. Over medium heat, heat the oil in a stockpot. Add the onions and cook until they start to brown a bit, about ten minutes. Add the turmeric and the corn, and then the dried limes along with their soaking water. Pour in the stock or water and bring to a boil. Cover the pot and simmer for about 15 minutes, or until the corn is tender. 2. Remove the pot from the heat. Squeeze the limes against the side of the pot to extract their flavor and then remove them. Let the soup cool a bit. Blend half the soup in a blender or using a hand blender. Add the saffron, salt and pepper. Add the lemon or lime juice, to taste. Serve hot or cold. There is so much food to talk about- ice cream, more ice cream, Persian rice, a rockin' onion tart, a new grill sitting in my backyard etc. All the food, as they say around here. But first, chicken and the mystery that is Jamie Oliver. I don't want to like Jamie Oliver as much as I do. As a sometimes grumpy introvert, I should find his relentless cheerfulness and enthusiasm annoying. Plus, he's everywhere. He's always publishing a new cookbook, starring in a new TV show, backing a new initiative, and so and on and so on. Enough. Hallas. And yet, somehow, someway I find his cheerfulness encouraging and enthusiasm genuine. His cookbooks are always good; his tv shows informative, and his initiatives causes that I believe in. I keep on waiting for him to let me down, and he keeps on hitting out of the park (insert parallel British idiom here). How in the ever-loving world does he do it? I mean, where does he find the time and the energy? Obviously he has assistants and staff and sous-chefs and probably a ghost-writer or two, but still. Still. What is this loveable thing we call Jamie Oliver? How? Which brings me back to chicken. I've made this chicken a few times now and every time it exceeds expectations. Sure, I mean, look- basil and tomatoes and a whole head of garlic are never going to be bad, but there's nothing quite like the transformation they undergo after an hour and a half in the oven nestled between chicken pieces. I don't know how Jamie Oliver knew it, but somehow he did. 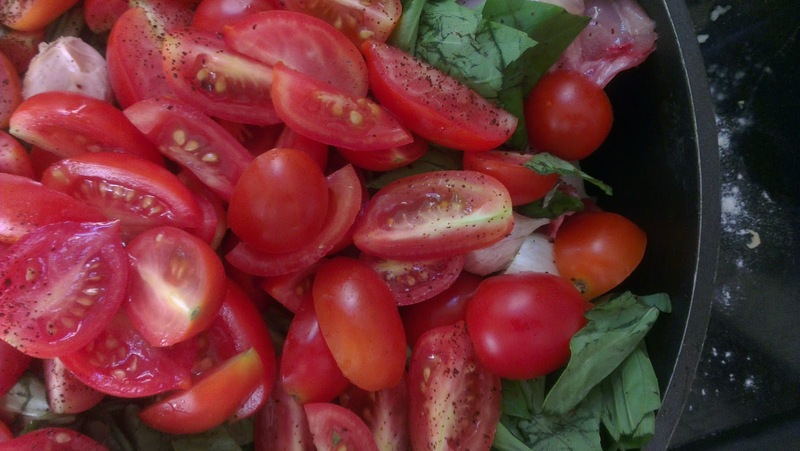 Somehow he knew how garlic would mellow and sweeten and tomatoes could collapse and infuse; how the great brightness of basil could become a complex back-note, a bass-line, if you will. Maybe Jamie Oliver knows the science of it, but to me it's a little bit magical- and isn't that the point? 2. Place the chicken in one layer in a pan or oven-friendly pot. Season with salt and pepper. Slice the tomatoes in half (or in quarters if they are very big, and add them to the pot, pushing the under the chicken. Add the basil, garlic, chili and potatoes, if using. Drizzle with a few good glugs of olive oil. Place in the oven, uncovered, and cook for and hour and a half, until the chicken skin is good and crisp and the meat is falling off the bone. The dish can be served as is, or you can remove the meat from the bones and serve over pasta. This Passover I saw your mother and met your dog. This was so unexpected, so unanticipated that I did not know how to process it. As it is, earlier in the holiday, sitting together with our friends, I was struck with a wave of missing you so strong that it felt like a physical thing- we weren't even discussing anything related to you-it was just the situation, all of us around a table, snacking, talking. Then your mother, and your dog, who you loved. You talked about him a lot. There he was, nosing at my hands and pushing his head into the curve of my palm to be stroked. And your mother, well, I hadn't seen her in years and years, maybe even over a decade. She looks the same, except she doesn't because loss is one of those things that leaves its mark. I wasn't emotionally prepared, but then again, especially now, I tend to think that we are never really prepared. I've been meaning to write about this ice cream for a while- since Passover, but it's fitting that I'm writing about it now, since that last time I saw Bayla was at the great Mouseline ice-cream parlor in Jerusalem. This ice cream is not quite as good as their chestnut ice cream, but it's pretty close. It's another one of Nigella Lawson's magical no-churn recipes, and it's easy as pie. If you can find chestnut puree you can make this in two easy steps. If you can't find chestnut puree, that's fine too, it's actually quite easy to make. All you need is some vacuum packed roasted chestnuts, sugar, water, and a food processor and you're good to go. To ice cream, friends and good memories. 1. Mix together the chestnut puree and rum or liquor. Set aside. 2. Whip the cream and confectioner's sugar until it just forms soft peaks. Fold in the chestnut puree mixture. 3. Transfer to an airtight container and freeze twelve hours or overnight. 1. Combine chestnuts, sugar and water in a saucepan and bring to boil. Lower the heat and simmer for 25-35 minutes until the water thickens and becomes syrupy and is mostly evaporated. 2. Remove from heat and strain, reserving the cooking liquid. 3. Place the chestnuts in a food processor and blend until smooth. Slowly add the reserved syrup until it is the consistency of say, pumpkin puree. Mix in the vanilla. Proceed with ice cream recipe above. Left-over puree should be stored in the fridge, though honestly it's so good you'll probably just end up eating the leftovers right there and then. As some of you might know, for the past eight months I had been working part-time as a translator for a news agency. I liked the work, I loved the people, I hated the hours. I think maybe, somewhere in the world there are people (namely, my former colleagues) who can get to work at 6am twice a week and still function as human beings. I am not one of those people. Waking up at 5:30 am screwed with my equilibrium. The work was shift-work so my early mornings did not occur on a set schedule-except for the last 4-5 months when I consistently worked every Sunday morning and one other day of the week. My sleep schedule was a wreck. I was losing evenings to early nights, and hours of other freelance work post-shift when I would wake up from my nap groggy and slow. It goes without saying that I haven't been doing much entertaining over the past few months. Weekends were a time to breath, to gather myself in quiet before I had to go stumbling out into the early morning dark again. A lot of friends have fed me over the past little while. A lot of friends provided me with books to read so I could sooth my brain. I am incredibly grateful to those lot of friends. I started a new job about two and a half weeks ago. It's too early to tell whether I like the job or not. I'm still getting adjusted, but so far it's been pretty good. The people at my new office seem nice and the work is more interesting than I had anticipated. To be honest though, the best things about my new job so far are the hours and the location. I start work at 9:30 am, and live about a 10 minute walk from my new office. This means I can wake up at 7:30 like a normal person. I can shower, drink my coffee, get dressed, put on make-up, pack a lunch and still have time to check my email before I mosey on down the block to work. For this reason alone I hope I am able to keep this job for a long, long time. I have my life back. Suddenly I want to talk to my friends. I want go out. I want to cook new foods. I want to entertain. So entertain, I did. For the first time in ages, I hosted friends over the weekend. 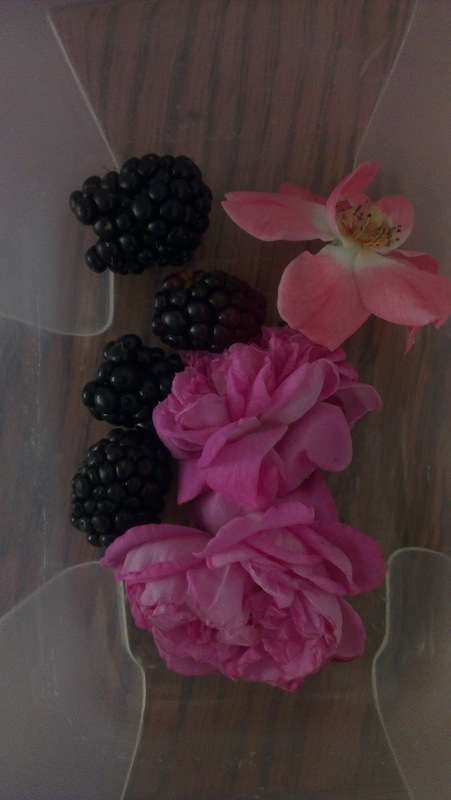 We ate outside in my garden, where surprisingly, both the strawberry and blackberry plants have survived the winter. We ate tacos. We drank cocktails with too much gin in them. We talked for long whiles. It was glorious. 10/10 would host again. Also glorious was the alternative lentil-walnut filling I made for the tacos. I had originally planned to just make fish tacos, but two of my guests hated fish, so I needed another, non-meat filling for the tacos. Generally, I am wary of foods that are not meat but claim to be like meat. Meat is meat. Other food is other food. But I found this recipe on Food52 and generally Food52 has never let me down, so I figured I would give it a shot. It was by far the most popular dish on the table. And sure, it doesn't look like much-but damn, is it good-meaty and tangy- and pretty much everything you want to put in your taco. 1. Place the walnuts in a food processor and pulse a few times to coarsely chop. Add the soy sauce, garlic, sun-dried tomatoes, spices and vinegar and pulse a few more times. Add the lentils and pulse until the mixture is incorporated. Hamshaw says the mixture should look crumbly-mine was smooth and had the texture of pate. Serve in tortillas or taco shells with lettuce, tomatoes, salsa, slaw and any other fun taco accouterments of your choosing. Tichye Krakowski. Powered by Blogger.